Ok, I’ve moved it down. Enjoy this picture until the urge to blog returns. 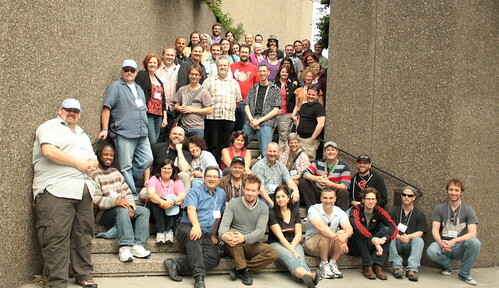 Posted in General | Tagged northernvoice, nv2013 | Comments Off on See you in Vancouver!! One of the things I always disliked about (audio) podcasting was having to link each episode to a blog post. I understood that podcasting grew out of blogging to a certain extent, but it bugged me to have to create blog posts, and make show notes or whatever. Video, somehow escaped this with sites like youtube. You just put the video there with the title “Man gets football in groin” , no need to walk through the different aspects of the video in the description. Meanwhile, back in audio-land, the “gurus” were telling us we had to have detailed show notes, so search engines would pick up on these, and spread the word etc …etc… blah..blah. RSS creation is automatic, there’s even a quick and dirty webpage example in there. That’s all you (I) really need. I’m not completely insensitive to those who want to read a blog, so I’ve added additional automation with IFTTT, and it takes whatever the hell shows up in the RSS and creates a post on the podcast blog. Commenting space if it’s ever needed 🙂 … If this holds up everything will happen with a simple file transfer. So I record and upload with Bossjock Studio on my iThing, and that’s it. Blogging not required. This is what I always wanted. Let’s see how this goes..
A cool thing happened recently, I was asked to join the cast of “Best Episode Ever” for this season. Other than a way for me to get back into podcasting, its also been a crap-load of fun to hang with Anthony Marco and Dave Brodbeck; 2 of the “good peeps” I’ve met in my podcasting life. It’s a whack o’ fun, and it’s got me back into podcasting… What’s next. Catfish show, or Bob and AJ? It’s done. PAB2012 was this past June, and it was the final instalment in the adventure that began 7 years ago. It’s a rare privilege to be able to decide when a long term project ends. There are plenty of examples of projects that were cut short by external forces, or even worse, allowed to run too long. Although part of me is sad the event is over, there’s a strong sense that this was the right time to end PAB, and I’m left with a great sense of satisfaction at what we accomplished from 2006-2012. I find it interesting now to step back and look at PAB as a body of work, as opposed to a string of individual events. There’s a whole lot I’m proud of about what we did with PAB, and thankfully, there’s nothing I regret, though there are things from which I learned. One of the things I’m most proud about PAB is the content evolution it took. Podcasting is what brought the group together initially, but it stopped being about podcasting once the how-to information became easily accessible. We could have gone the easy route, and become an event about social media and online interaction. Somehow, while we couldn’t put our finger on it, we knew that this wasn’t the place to go with this group of people. Good stories and being human is what created the connections, and we did our best to grow from that. Of course when the core aims of a project don’t include ‘make money’, it allows us to be bigger risk takers, and choose speakers/directions that weren’t all based on google-juice. I won’t name any here, for fear of leaving someone out. Suffice to say almost everyone who ever presented at PAB enriched me as a person. The biggest lesson Mark taught me is that you need to give people a chance to say ‘No’. If you want to ask someone for something, don’t assume that ‘no’ will be their answer and not ask them. Make sure you give them the opportunity (in some cases, multiple opportunities, hehe) to say no. You just might be surprised, and get a “Yes” instead. I purposefully didn’t blog pre-PAB this year, I didn’t want to build hype or anything, I wanted PAB to be PAB. If someone didn’t get it by now, they never would, and that’s ok. In seven years, PAB could have evolved to become a lot of different things. Now, as I look back, I realize that PAB was, exactly, what it was meant to be. 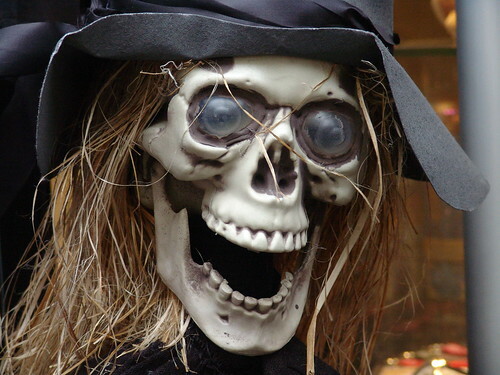 If you’ve been online for any amount of time, chances are you have some dead online projects. It could be an old blog, podcast, the website of your wedding x-years ago, whatever. You may have used a tool like WordPress or Joomla to create the site initially, nice themes, easy content creation, up and running SUPER quick – canoefuls of awesomeness, until the project is over. When it’s over, you now have a site to maintain or take offline. Yup, hackers and evil-doers find new ways to break into things all the time, and the software creators are usually a step or two behind them. So you need to keep these sites updated to keep them from being hacked. Like a lot of us, I use a shared hosting package, where a lot of my sites are hosted on the same account. So this past weekend, when an old blog (or maybe an old plugin on a newer blog) fell victim to a hack, it was successful infecting pretty much all the sites I had hosted there. Crap. Not a fun way to spend time, this delayed my finding the answer to life, the universe and everything. (I know it’s 42, but I wanted to do the math myself). I won’t bore you with the technical details, but let’s just say I’m happy this was on a unix box, grep and sed continue to be good friends of mine. I’m at the point now where the “active” projects are back online, and I need to do something about the dead projects. I’m looking at tools that convert WordPress sites into static html, and get all the database and php out of the way. A static site, while not easily updatable, is a great way to treat your dead, but not quite offline, projects. I’d like to keep the Bob and AJ site up a while longer, but not invest the time maintaining it. So there’s your warning, even if your project is dead, keep the software and plugins updated, or look into converting to static to save yourself some headaches. Somewhere, as social networking expanded online, the masses lost the ability to dislike stuff. I know, it’s because existing online is a wonderful kumbaya everyone loves everything everywhere kind of place, right?! I can think of countless examples of sites, opinions, people I dislike. I’m sure you can think of quite a few as well. There needs to be a way to dislike something without having to join Anonymous. Some sites seem to come close – If you look at reddit for example, you can vote an item up (or like it), and you can vote items down. It’s one of the reasons reddit seems to work well, there’s a community filter in effect, and to be honest, it’s usually quite good. The thing about this approach though, is that the more down votes an item has, the less chance it has to be seen. I think this opens up the possibility of down voting masses attacking a particular idea, so it won’t get seen. There are times when people should be allowed to show they disagree with something, without that affecting how many people see that item. Just because I happen to dislike something, I shouldn’t affect other people’s exposure to it. facebook and Google+ don’t want to see the other side of the coin. They only let you “like” or “+1” something. The least reaction is no positives, that’s not how life works. It wouldn’t affect where an item shows up in the stream, or even generate extra SEO to it. Don’t make it too attractive to try to get -1’s, just allow people to show that they dislike or don’t approve. While we’re adding buttons, maybe even add a “0”, to say “I’ve read this, and it leaves me indifferent.” Seems like it’d be easy to do… and would generate valuable information. You can learn a lot about a person by paying attention to what they like, you can learn even MORE by paying attention to what they don’t like.